The Isle of Skye occupies an almost mythical place in the minds of many Scots. Romantic castles, magnificent sea-scapes, the alpine peaks of the Cuillin Ridge, marching pip bands, scattered white crofters' cottages and a bloody history: the island has all these and more. This walking guide features 40 moderate walks that take in much of this celebrated landscape, but reveals hidden gems too. In spite of its popularity Skye is still rich in undiscovered treasures, from coastal caves and arches, ruined villages cruelly cleared of their inhabitants, to fossilised dinosaur footprints and a rich array of wildlife. 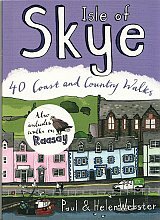 Written by Skye residents Paul and Helen Webster, these walks will reveal both the wild and gentler sides of this dramatic landscape.